While there are big gaps in average education levels among different religious groups, these disparities have been narrowing in recent decades because those at the bottom made the biggest educational strides. A new Pew Research Center study, analyzing data from 151 countries, looks at education levels of Jews, Christians, Buddhists, Hindus, Muslims and religiously unaffiliated adults ages 25 and older. The demographic study also examines changes in educational attainment over three recent generations. 1When measured by years of formal schooling, Jews have the highest average educational attainment, while Muslims and Hindus have the lowest. 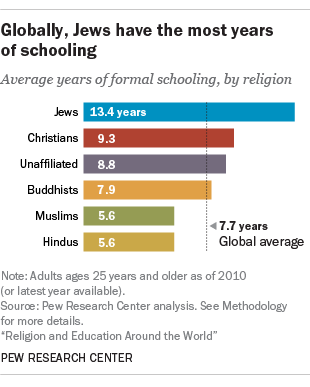 Christians have the second highest average years of schooling, followed by religiously unaffiliated adults and then Buddhists. However, across three recent generations, Muslims and Hindus have made the biggest educational gains of all the religious groups studied. The youngest members of these two faith groups (those born between 1976 and 1985) have almost twice as many years of schooling as their oldest peers (those born between 1936 and 1955). 2Religious minorities often have more education, on average, than a country’s majority religious group, particularly when the minority group is largely foreign born and comes from a distant country. For instance, Hindus have one of the lowest educational attainment levels at the global level, but in the U.S., where they are a religious minority and 87% are foreign born, they have the highest educational attainment of any religious group. 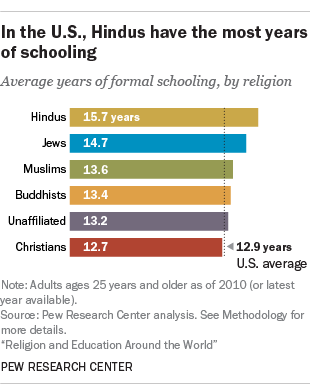 U.S. Hindus have 15.7 years of schooling, compared with 12.7 years of schooling, on average, among Christians, the majority religious group in the U.S. In some cases, this difference in attainment between religious minorities and majorities is because members of the minority religious groups were selected under immigration policies favoring highly skilled applicants. In addition, it is often the well-educated who manage to overcome the financial and logistical challenges to successfully settling in another, far-off country. 3There are important differences in educational attainment between religious groups living in the same region, and sometimes the same country. In sub-Saharan Africa, for example, Muslims generally have fewer average years of schooling (2.6 years) than Christians (5.8 years). Muslims also are more than twice as likely as Christians in the region to have no formal schooling (65% versus 30%). This is the largest share with no formal schooling among Muslims of any region in the world. 4Women in all faith groups have made bigger gains than men in educational attainment. As a result, educational gender gaps have narrowed somewhat among younger generational groups. Among those in the oldest generation (ages 55 to 74 in 2010) in all religious groups, men received more years of schooling, on average, than women. But in the youngest generation (ages 25 to 34 in 2010) of Christian, Buddhist and unaffiliated people, women have achieved parity with their male counterparts in terms of average years of schooling. And the youngest Jewish women have spent nearly one more year in school than the youngest Jewish men. Finally, when it comes to higher education, Christian, Jewish and religiously unaffiliated women in the youngest generation are more likely than their male counterparts to have college degrees. 5At the global level, religiously unaffiliated adults have 1.3 more years of schooling, on average, than religiously affiliated adults (8.8 years versus 7.5 years). One reason for this is that unaffiliated people are disproportionately concentrated in countries with relatively high overall levels of educational attainment, while the religiously affiliated are more dispersed across countries with both high and low levels of educational attainment. However, the unaffiliated do not consistently have higher attainment than their religiously affiliated compatriots when examined on the country level. In the 76 countries with data on the youngest generation of unaffiliated adults, they have a similar number of years of schooling as their religiously affiliated peers in 33 countries; they are less educated in 27 countries, and they are more highly educated than the affiliated in 16 countries.